I consider dragonflies to be some sort of personal spirit animal. They're extremely symbolic to me. My day can be going downhill in the worst way, I'll spot a dragonfly, and things get better almost instantly. Or it's a personal reminder that everything is going to be okay. I'm not sure why that is exactly, but it happens. This week alone I've seen at least two or three dragonflies each day. Sure, maybe it's because of all the humid weather Arizona has had this week. But I always like to believe that someone somewhere knows I've been needing them as a sign that no matter how down I get, everything will be okay. I think the first time I noticed this phenomenon happen was on a day my ex was leaving to go back home. We maintained a long distance relationship and he had been visiting for a few days. I was crying as he left and driving back to my apartment. And then a dragonfly flew by and I felt better. I felt that everything was going to be okay. The first time I incorporated a dragonfly into my art was during a watercolor class. We were supposed to be doing a sort of self portrait with objects. I had a dragonfly finger puppet that I've had since I was little and used that as one of the objects. That was the first critique I ever cried in (come on, admit you've cried during a critique or a class at one point or another at least once) because I realized the absolute significance of dragonflies to me personally. I've since used dragonflies in other projects and all my friends and peers know what they mean. Everything is going to be okay. I kept meaning to take pictures of the progress of this reliquary project for Advanced Surface Design, but it just never happened. I maybe have one shot of me embroidering it. Also, blogging is one of the last things I'm thinking of as I'm in panic mode (this entire weekend was panic mode) trying to make something work, or trying to finish it on time. So, here is my Requiem for a Sand Dollar. The embroidered purple swirly things are meant to be something like mermaid tails because it is a folk belief that sand dollars are lost mermaid coins. The blue embroidery reminded me of tentacles. 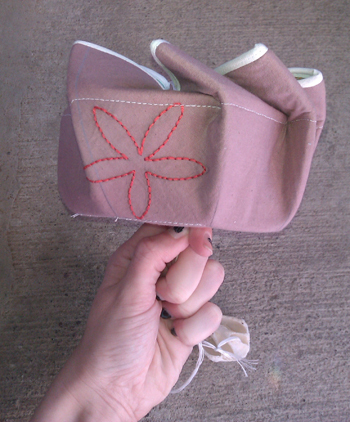 The strings along the sides are threaded through the middle (under the sand dollar). They are attached to the shell at the bottom and when you pull them, the box closes. However, you have to pull pretty hard and hold it. It won't stay closed. This frustrates me because the size requirement says 6x6" (or 7, she gave us an inch of breathing room). And open, it's not that size. My sister made the comment that it is a reliquary for something from the sea and the sea cannot be contained, so it wants to burst out. I liked that. Also, the sort of flower embroidery on the outside was meant to represent the design on sand dollars. Why did I do a sand dollar? It goes along with the ocean theme I had started last semester in my first Surface Design class. Also, I was thinking about how many reliquaries have bits of bone and things from saints. Well, a sand dollar isn't but a skeleton of a sea animal so I thought it was fitting. Critique is this afternoon (Monday, February 13), and I'm a bit nervous because I felt like this project could have gone so much better. Namely, I wish it would stay closed without me holding it. But, again, it's the sea and it cannot be contained. I'm considering having it hang on the wall until we get to me in the critique. Now, I would like to know what you think of this. Please let me know in the comments below!